During one long, hot summer, five-year-old Pea and her little sister Margot play alone in the meadow behind their house, on the edge of a small village in Southern France. Her mother is too sad to take care of them; she left her happiness in the hospital, along with the baby. Pea's father has died in an accident and Maman, burdened by her double grief and isolated from the village by her Englishness, has retreated to a place where Pea cannot reach her - although she tries desperately to do so. Then Pea meets Claude, a man who seems to love the meadow as she does and who always has time to play. Pea believes that she and Margot have found a friend, and maybe even a new papa. But why do the villagers view Claude with suspicion? And what secret is he keeping in his strange, empty house? 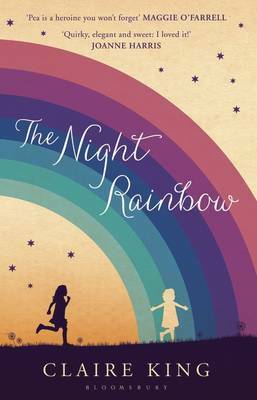 Elegantly written, haunting and gripping, The Night Rainbow is a novel about innocence and experience, grief and compassion and the dangers of an overactive imagination.